SHERMAN, Texas (CNN) -- The father of a U.S. soldier accused of killing five fellow troops at a stress clinic in Iraq says it wasn't combat stress that made his son kill. The dad says it was fellow soldiers who pushed him over the edge. 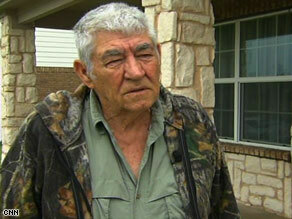 Wilburn Russell says unspecified threats were made against his son recently. "They ruined him." "His wife told us that he e-mailed her and said he'd had the worst two days of his life, because some of the officers had threatened him," said Wilburn Russell. His son, Army Sgt. John M. Russell, 44, is charged with five counts of murder and one count of aggravated assault related to Monday's killings. "Well, you don't have much recourse when you have officers riding you." The father added, "He took matters in his own hands." "We're devastated. We're heartsick, not just for our son but for the people involved -- the people who got killed, their families. My gosh, it's a horrible thing. It's impacted hundreds of people." The father said he was not sure what sort of threats might've been leveled against his son. But he said stress-test technicians had "overstressed him." "They broke him. They ruined his life. They told him, 'You're an idiot. You don't belong in here. We're gonna break you.' "
The military has not commented on the father's accusations. Sgt. John Russell is now in military police custody at Camp Victory. Russell had gone to the stress clinic for tests Monday at Camp Liberty, near Baghdad's international airport. A senior defense official said that when Russell was leaving the clinic, he "became hostile, and an altercation broke out." He was then escorted back to his quarters by another soldier, said the official, who has read the most recent summary of the investigation in Baghdad. A couple of hours later, Russell seized a weapon from a fellow soldier, "commandeered" a vehicle and drove back to the clinic, the defense official said. A soldier from Russell's quarters called military police, but they weren't able to stop him in time. Among those killed in the shooting was Navy Cmdr. Charles Springle, 52, of Wilmington, North Carolina. Springle was part of the 55th Medical Company, stationed at Camp Liberty. Another slain soldier was identified as 19-year-old Pfc. Michael E. Yates Jr. The military has not released the names of the other victims, pending notification of their families. Yates' mother told reporters Wednesday she harbors "mixed emotions" toward the attacker who killed her son. "I feel for him, but at the same time I am very angry at him." said Shawna Machlinski. Russell's father said he was surprised the way the military handled the situation after the fight at the clinic. "They turned him loose with a guy with a gun. ... He beat the crap out of the guy and took his gun away from him." Russell was on his third tour of duty in Iraq. He is from the 54th Engineering Battalion, based out of Bamberg, Germany. The 54th's 15-month deployment began in May 2008; the battalion is due to leave Iraq in August. Wilburn Russell described his son as a "John Wayne" type, a real "a man's man." He rejects the military's contention that his son's combat duty pushed him beyond the brink. "That's not true. The stress is what they put him through," he said of the counseling. He said they told his son, "You don't have enough brains and gumption to be a sergeant." "They had ruined him," the father said. "He couldn't handle it. It overwhelmed him." Russell's son, also named John, said he received an e-mail on April 25 from his father, wishing him a happy 20th birthday and telling his son that he was looking forward to coming home this summer. There were no signs of distress in that note, the son said. "I think that they just got to him, and he just couldn't take it. ... Something in his mind just, just went off, and he just had no control over it is what I think."